Some may include different word classes from these; they may also define the boundaries between the classes in different ways. E.g. some may treat pronouns as a separate word class, but we will consider them a subclass of nouns, which we will look at in a bit more detail next class. Differences like these highlight an important principle in grammar — GRADIENCE which refers to the fact that the boundaries between the word classes are not absolutely fixed. Using this criterion, we generalize about the kind of meanings that words convey. we could group the words husband, car, Idhurees, house, and Maldives, on the basis that they all refer to people, places, or things. and words like cook, drive, eat, run, shout, and walk because they denote some kind of “action”. This approach has certain merits, as it lets us determine word classes by replacing words in a sentence with words of “similar” meaning. My husband cooks dinner every Friday. My husband prepares dinner every Friday. My husband eats dinner every Friday. My husband orders dinner every Friday. My husband misses dinner every Friday. On the basis of this replacement test, we can conclude that all of these words belong to the same class Ã¢â‚¬â€œ “action” words, or verbs. However, this approach also has some serious limitations. E.g. the traditional definition of a noun Ã¢â‚¬â€œ word denoting a person, place, or thing, is inadequate, as it does not account for abstract nouns like time, imagination, repetition, wisdom, chance. Similarly, if verbs are “action” words, how do we categorize verbs like be, in I want to be a doctor. This criterion refers to where words typically occur in a sentence, and the kinds of words which typically occur near them. He cooks dinner every Friday. Obviously there is no one-to-one relation between words and their classes. E.g. cook can be a verb or a noun Ã¢â‚¬â€œ depending on how the word is used. In fact, many words can belong to more than one word class. However, they only belong to one word class at a time, depending on how they are used. Some word classes are OPEN Ã¢â‚¬â€œ i.e. new words can be added to the class. E.g. the class of nouns is potentially infinite, it is continually being expanded as new discoveries are made, new products are developed, and new ideas are explored. 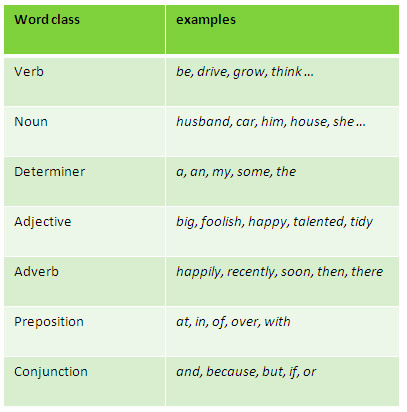 The adjective and adverb classes can also be expanded by the addition of new words, though less prolifically. On the other hand, we never invent new prepositions, determiners, or conjunctions. These classes include words like of, the, and yet. They are called CLOSED word classes because they are made up of finite sets of words which are never expanded (though their members may change their spelling, for example, over long periods of time). The subclass of pronouns, within the open noun class, is also closed. Words in an open class are known as open-class items. Words in a closed class are known as closed-class items.